Who are the Storm fans? In The Seattle Times, Jerry Brewer reports on the challenges faced by the group of women who own Seattle’s WNBA team, the Storm. It ain’t easy owning the Storm. No women’s sports team in America has ever had lasting success, and as Jerry puts it, owning the team is “neither a luxury nor a hobby. It’s an assignment, and sometimes a burden” for these dedicated women. To get a sense of just how much women’s pro basketball is up against, look no further than the slew of disparaging reader’s comments on The Times story. It’s an uphill battle, to say the least. So the Storm have plenty of detractors, sure. But they have their fans, too. Just who are the Storm’s fans? I delved into data from market research firm Scarborough, which surveys people from the Seattle metropolitan area, to find an answer. I looked at people who attend Storm games, and compared them to people who attend games of our other pro sports teams–the Mariners, Seahawks and Sounders. Two things you probably already assume about Storm fans: that they are fewer in number and more female than fans of our other sports teams. And the data show you’d be right on both counts. Just two percent of folks in the Seattle metro have been to a Storm game in the past year. In comparison, nine percent have been to a Sounders game, 10 percent to a Seahawks game, and 25 percent to a Mariners game. And women make up 56 percent of Storm attendees. All the other pro sports teams here have much higher male than female attendance. (Still, if you thought only women went to Storm games, you’d be wrong, since 44 percent are men). But then there are some things that might surprise you about Storm fans. What I hadn’t expected to find was that Storm fans are, in some significant ways, far more diverse than than any of our other sports teams’ fans. This is certainly true when it comes to racial background. Comparing all four of our pro sports teams, Storm fans are the least likely to be white, and the most likely to be either black or Hispanic. Also, Storm fans are the most likely to consider themselves not fitting into any of the main racial categories (this could include people who are multi-racial as well as other groups). They are, however, the least likely to be Asian (the Mariners have the most Asian fans). Still, overall, Storm games attract the most racially diverse crowd of any Seattle team. Another area of diversity for Storm fans is in their educational background. Of all four pro sports teams here, Storm fans are much more likely to have been to graduate school–nearly double the percentage of any of the other sports teams. But at the same time, Storm fans are also the least likely to have a college degree. That might sound contradictory, but it’s not; what it means is that Storm games are drawing people with very diverse educational attainment levels–a large group of the highly educated alongside a large group of folks who didn’t complete college. So when it comes to race, education, and occupation, fans of the Storm are the least homogenous of Seattle sports fans. 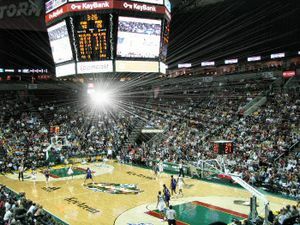 Any Storm fans care to chime in on what the vibe is like at Key Arena? Does that diversity among the fans come across when you’re at a game?